Before long, other readers wrote chiming in about their blue jay sightings and lack thereof, inspiring the Gazette to investigate. Howland’s question, as it turns out, is difficult to answer. In any given year, it’s hard to determine a bird species population level, said Kit Straley, a University of Massachusetts Amherst Ph.D. candidate in organismic and evolutionary biology who conducts research on birds. “I wish it was straightforward,” she said. In the United States, Straley said that generally blue jay numbers are decreasing, while in Canada they’re rising. “A large part of that is their access to mature trees,” Straley explained, adding that as people clear more land, there’s less food for the birds. Overall, though, the species is of low conservation concern, according to the Cornell Lab of Ornithology. An informal measure is eBird, a website where bird enthusiasts can log which species they see and where. The site has many reported blue jay sightings from the past two months throughout Hampshire County. The 2018 Audubon Christmas Bird Count — a citizen science project that sends out volunteers to count birds in a specific area for a day in winter — did observe about half as many blue jays than the previous year in an area that includes much of Hampshire County, Straley said. 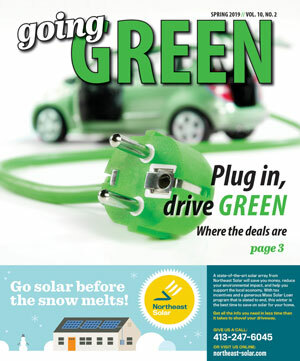 “But the weather was bad this year,” said Straley, who participated in the recent bird count. Not unlike humans in the winter, when it’s cold and there’s no snow cover, blue jays tend to hunker down and hide, making them harder to spot. And without snow covering the ground, the birds can access acorns they stashed, making them less reliant on bird feeders, according to Straley. Predators in the area can also lead to fewer sightings; for example, if a hawk frequents your backyard, that can drive jays away, Straley said. 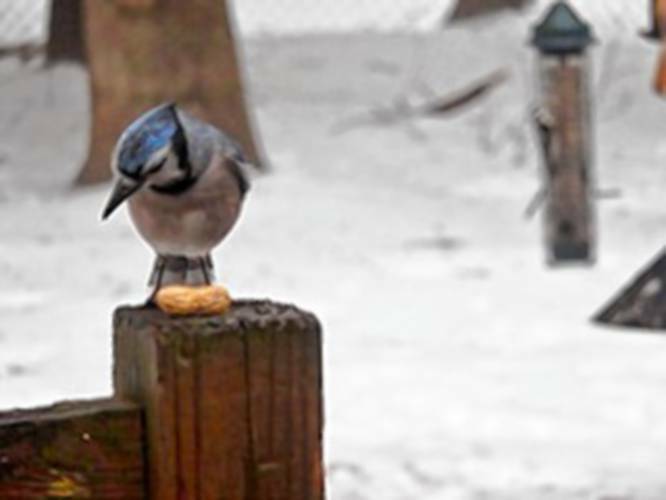 After the large snowstorm last weekend, Timothy Russell saw blue jays make a comeback in his backyard in Amherst. He sprinkled some seeds on the snow-covered ground in his backyard to keep them coming back. “They went pretty wild with that,” he said. 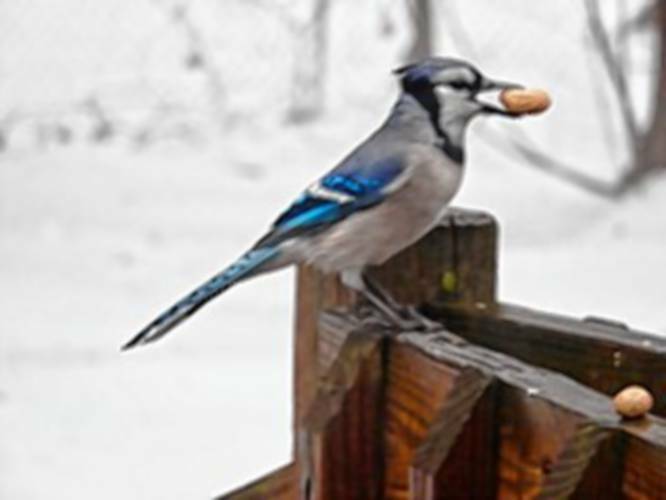 Diane Brawn of Florence also reported recent blue jay sightings on her deck, where she’s been feeding jays peanuts for 20 years.